This week's release turbo-charges the change art screen. 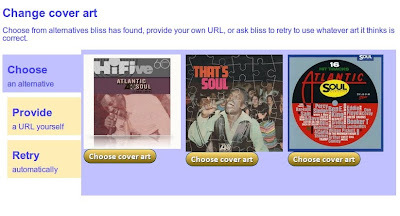 For any album, we now offer the ability to choose from a range of alternatives bliss has found, provide your own URL, or ask bliss to refresh and have another go at picking (this could be useful if there was, say, a temporary problem with your Internet connection). We also made some BIG improvements in the amount of data downloaded as bliss works. This amount should be much smaller now.